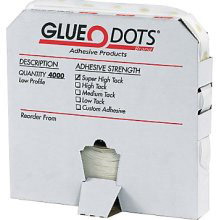 Glue Dots are packaged in a convenient dispenser box. High tack strength secures items to virtually any flat surface. Low Profile Glue Dot thickness is 1/64". Bonds instantly to attach paper, coupons, and business or reply cards to samples. Clear Glue Dots remove cleanly and easily. Glue Dots are always faster and safer than hot glue guns. Allow 2 days to ship.